Nails by Kayy from Laque Nail Salon talks celebrity clients, her favorite polish brands and summer nail trends. 1. 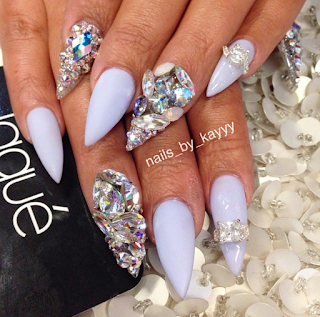 Where did your career as a nail tech begin? 2. When you consult with a client to create the perfect manicure, what kind of questions do you ask them to determine exactly what they are looking for and how you are going to make it possible? I ask them what they do for a living, how hard are they with their hands, what their ideal nail length is, I ask if they are trying to grow their natural nails or simply like getting extensions. Most of the time clients come in with an idea of what colors or designs they want, if they don't then I ask what color schemes do they usually go for and also what designs they would be comfortable wearing. 3. Laque nail bar is very popular with celebrities. Have you worked with any celebrities? If so, who and what was your experience with them? I've worked with many, one of my favorites is Laurieann Gibson, she's a sweetheart, she's been my client for over a year now and it's a pleasure doing her nails. Other than that, I've done Blacc Chyna, Keri Hillson, Marisela (a known 90's singer in the Hispanic community), Christina Millian, Norma Jean (singer of the group Chic from the 70's) ..and I can't recall others at the moment. 4. What are this summers hottest nail trends? 5. What is your favorite brand of nail polish and why? I can't really choose one brand, I believe they are all unique and as a nail artist I appreciate every single one of them. I'd say my top three would be OPI, Essie, and Zoya. 6. What advice can you give to help nails look flawless for as long as possible? I always tell my clients to remember that nails are not tools, acknowledge that you have nails on and you'll see a difference in the duration of your nails. Hands down with Seche Vite, my favorite so far. This is a difficult one, I'd say, hair stay on conditioner since I have curly hair, lotion since I hate being ashy, and baby oil. 9. What is the best part about working at Laque Nail Bar? The best part of working at Laqué Nail Bar is getting to see my clients happy as they walk out after their service, it is all about the satisfaction of knowing that they leave happy with the nails they get done.